I can't say that I'm really familiar with The Clash, aside from the stuff that is played on the radio. I understand their influence and importance, but I just haven't dug into their catalog just yet. On rare occasions I'll actually hear this one. I really don't know why, but this song has always stuck with me. It's a pretty basic song, in that the lyrics and meaning are pretty straightforward and the music is simple and great. Usually, those simple elements make for a great and timeless tune. 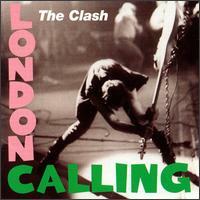 Interestingly enough, this song was a "hidden track" on London Calling. The band was so worried about it not being as punk as the rest of the album that it was tacked on to the end. Turns out it's a great song and it cracked the Top 40 in the U.S. Very punk, indeed. I really love the lyrics, too. It's an awesome breakup song. "You didn't stand by me, not at all / You didn't stand by me, no way." Be sure to check out Annie Lennox's version and Dwight Yoakam's, even though they don't have any cowbell in them. Also of note is that the band Garbage sampled the drum track and used it as the basis for their song, "Stupid Girl."